Watsonville, CA - 2009 will see several new additions to one of the west's great county fairs. 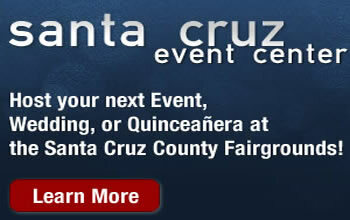 One of the additons is an arts and crafts area on the Santa Cruz County Fairgrounds. Local artisans and craftsmen are invited to take advantage of special rates and rules that make it easier for them to show their work to the tens of thousands who visit the Fair each year. Fair manager John Kegebein explains the new program. "We are aware that six days is a long time for a single artist to spend at one location, so to accommodate as many as possible for the 2009 Fair we have set aside a separate area with a special daily rate. We have also adopted special conditions to rent a space. If an exhibitor cannot be at the Fair for the full six days, they may partner with another arts and crafts exhibitor, share the booth, and share expenses."